San Mario is going to release a Proof .925 fine silver €10 coin honouring the 17th Century Italian painter Caravaggio on 28th June. Michelangelo Merisi or Caravaggio was a great painter from Baroque, whose creations are admired all over the world even today. The coin celebrates the European Year of Cultural heritage. Through this initiative, people are being encouraged to respect and learn more about the cultural heritage of Europe. 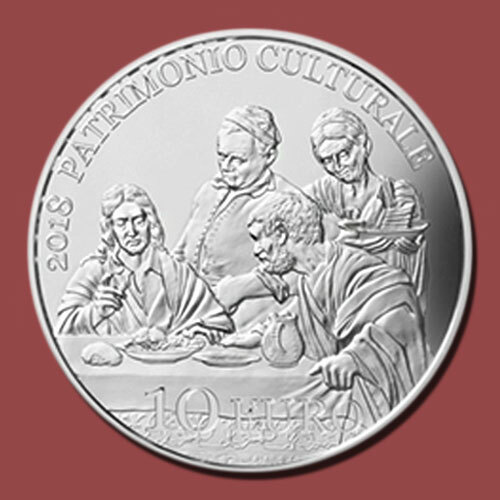 The coin depicts a particular section of Caravaggio’s painting named “Supper in Emmaus” which was created between 1605 and 1606. The original painting is showcased at the Pinacoteca di Brera in Milan. The painting recreates the sacred moment with intimate and dramatic characters with a theatrical use of light. Antonella Napoli designed the coin and Helmut Andexlinger sculpted it. The 22.4 grams coin, struck at the Austrian Mint, has a mintage limit of 3,400 pieces, and can be purchased for €38.